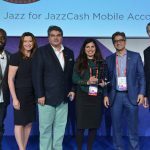 Pakistani mobile money account provider JazzCash wins GSMA Glomo Awards 2017. The subsidiary owned by Pakistani telecom giant Jazz, was declared the “Best Mobile Product, Application or Service for Women in Emerging Markets”. The award falls under Social & Economic Development category. Aamir Ibrahim, the President and CEO of Jazz received the award. Global Mobile Awards, or the GSMA Glomo Awards were held in Barcelona from February 27 to March 2, 2017. “It is a proud moment for all of us at Jazz. We are proud that our efforts have been recognized at this international forum. This further reinforces our resolve to ensure that each and every customer benefits from the digital revolution spearheaded by Jazz.” said Aamir Ibrahim, the President and CEO of Jazz. Aniqa Afzal Sandhu, who looks after Jazz as the Chief Digital & Financial Services Officer, was also present during award receiving ceremony. It is an honor to get recognition at such a prestigious global platform. In a world going digital, we are constantly innovating our products so that our customers, especially women, are able to benefit from the convenience of digital financial services.” added. “It is an honor to get recognition at such a prestigious global platform. In a world going digital, we are constantly innovating our products so that our customers, especially women, are able to benefit from the convenience of digital financial services.” said Aniqa Afzal Sandhu. Michael O’Hara, the Chief Marketing Officer of GSMA congratulated all the winners in 7 categories. JazzCash Mobile Account is one of the few in Pakistan that is enabling women to participate in economic activities. The innovative services provided by Jazz are creating a deep impact on empowering entrepreneurs and small businesses in Pakistan.